Shop beaded saree border and sari ribbon from our collection. Antique Gold Indian Trim By 4 Yard Ribbons Kundan Lac.. Fringe trim can add that perfect finishing touch to any finish clothing accessories. Beautiful Metallic Black Gold ..
Indian Gimp Trim for Gimp Braided Trim, Gimp Braid, Braided Cord, Gimp Cord, Braided Gimp Trim, Scroll Braid Trim, appro..
We have a large collection of fringe ribbon and border that can be used for jewelry making. Mint Green Indian Gimp .. Decorative gimp trimmings for garments. Indian Gimp Trim for Gimp Braided Trim, Gimp Braid, Braided Cord, Gimp Cord..
Use our decorative laces and ribbon for making purses. Indian Gimp Trim for Gimp Braided Trim, Gimp Braid, Braided ..
Make beautiful wedding wear using our ethnic trims and border. Indian Gimp Trim for Gimp Braided Trim, Gimp Braid, .. Looking for beaded laces for your sewing and craft projects. 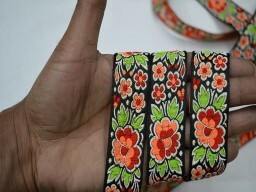 Indian Gimp Trim for Gimp Braided Trim, Gimp Braid, Br..
Use our retro ribbon and laces for book binding and scrapbooking. Yellow Indian Gimp Trim for Gimp Braided Trim, Gi.. The art of decorative is ancient. Saree Border Trim By 2 Yard Embroidered Sewing Trim Ribbon Decorative Ribbon Trim..
Wholesale Decorative Trim Gold Kundan Trim Stone Work Sari Border Trim by 9 Yard Costume trim Embellishment, Border, Rib.. Decorative Trim Costume trim Metallic Ribbon, Beaded Trim, Dull Gold Kundan Lace, Trimmings, Embellished Mirror work Bor.. Decorative Trim Costume trim Metallic Ribbon, Beaded Trim, Gold Kundan Lace, Trimmings, Embellished Mirror work Border, ..
Wholesale Brocade Crafting Ribbon Trimmings Indian Jacquard Sari Border Sewing Trim Metallic Trim Decorative Ribbon Jacq..
Wholesale Craft Trim Crafting Ribbon Decorative Trim By 9 Yard Jacquard Trim Brocade Jacquard Ribbon Trimmings Indian Sa..
Wholesale Decorative trim ribbon Wholesale Trimming Brocade Jacquard Ribbon Trim Jacquard Trim By The 9 Yard Indian craf..
Wholesale Brocade Jacquard Ribbon Leaves Pattern in Yellow and Metallic Gold Weaving Border Lace Trim. This can be hand ..
Wholesale Decorative Ribbon Trim By 9 Yard Metallic Sewing Trim Crafting Ribbon Costume Trim Jacquard Ribbon Wholesale T..
Wholesale Indian Trims, Trimming, Fabric trims and embellishments, Decorative Trims, Embroidered Trim, Trim By 9 Yard, T..
Wholesale Indian Sari Border Lace Brocade Jacquard Ribbon Trim Decorative Ribbon Designer Lace Jacquard Ribbon By 9 Yard..
Wholesale Jacquard Ribbon By 9 Yard Jacquard Border Lace Trim Brocade Jacquard Ribbon Trim Indian Sari Border Lace Decor..
Wholesale Brocade Jacquard Ribbon Trim Craft Ribbon Jacquard Trim Indian Sari Border costume trims Decorative Ribbon Tri..
Wholesale Craft Trim Crafting Ribbon Decorative Trim By The 9 Yard Jacquard Trim Brocade Jacquard Ribbon Trimmings India..
Saree Border Trim By 9 Yard Embroidered Sewing Trim Ribbon Decorative Ribbon Trimmings Craft Ribbon, Costume trim, Fashi..
Wholesale jacquard ribbon, jacquard trim Brocade Crafting Ribbon Trimmings Indian Jacquard Sari Border Sewing Trim Metal..
Wholesale Turquoise Silk Sari Border Indian Trim By 9 Yard, Embroidered fabric trims and embellishments, Decorative Trim..
Gold Gota Trim, approximately 1.5 Inch Wide for your wedding dresses This is traditional rajasthani gota pati lace, this..
Wholesale Metallic Trim Decorative Trim By 9 Yard Brocade Jacquard Ribbon Trimmings Indian Sari Border Jacquard Border L..
Wholesale Yellow Gold Kundan Lace - Sari Border Trim by 9 Yard - Metallic Ribbon Glass Bead Work Embellishment / Border ..
Embroidered Ribbon Trim, Silk Sari border Trimmings, Decorative Trim, Indian Trims, Craft Trim Designer Sewing Trim Fash..
Wholesale Costume trim, Trimmings, Embroidered Trim, Decorative Trims, Sari Border, Trim By 9 Yard, Sewing Indian Fabric..
Embroidered Ribbon Sari Border Crafting Ribbon Trim Ribbon Border Decorative Ribbon trim by the yard Indian Trim tape em..
Wholesale Indian Bead Lace Trim Gold Beaded Costume Wedding Dress Sash tapes lace trim ribbon Hair Accessories, Bridal B..
Wholesale Embroidered Trim, Decorative Trims, Sari Border, Trimmings, Trim By 9 Yard, Sewing Indian Fabric Trim, Costume..